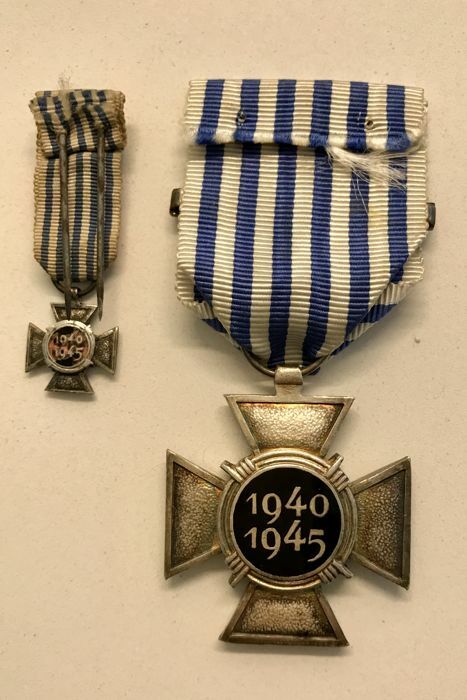 The Political Prisoner Cross 1940-1945 Awarded to those that were arrested during the war as political prisoners, this silver coloured cross was instituted on 13 November 1947 and usually issued with minimum one bar denoting the amount of time spent in captivity. According to the length of imprisonment, the bar has between 1 and 4 stars on it, one star per half year. If the recipient had been held longer, a second bar was added with the appropriate number of stars. 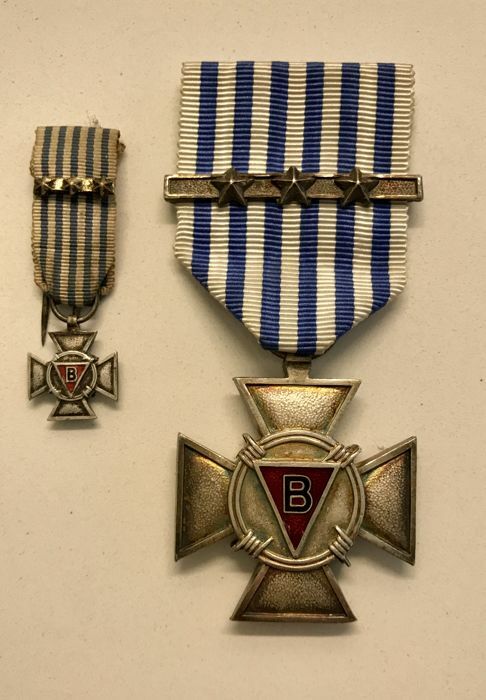 If awarded posthumously, the recipient not having survived his/her captivity, a black enamelled bar was put over the other bar(s) and the cross could be worn by the deceased's widow, mother or father (oddly enough - or should one say stupidly - no provisions were made for widowers; female recipients seem to have been supposed to be unmarried). 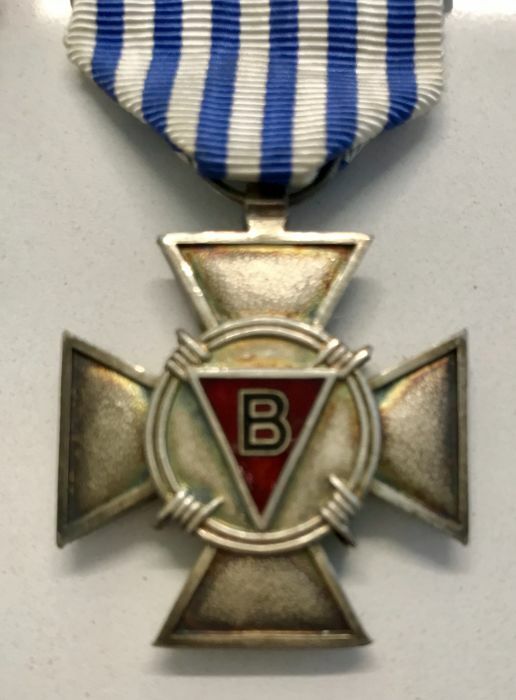 The obverse of the Political Prisoner Cross has, in the central medallion, a red enamelled triangle, point downward, with a black enamel letter "B" in it (the classification triangle which Belgian political prisoners wore on their prison uniform) while the white ribbon with light blue stripes represents the prisoners' clothing. All medals will be shipped in protecting padded envelopes, “registered mail” with tracking number, through Bpost ( Belgian postal services ). Bear in mind that I’m not responsible for the rudeness of postal services !! All auctions are “wysiwyg”, Observe & Reverse pictures shows the medals that will be sent, nothing else. You are bidding to buy, not to see !! I always ship to the mailing address given by Catawiki, so be sure your mailing address is the right one, I will not ship a second time without extra cost. If you do not agree with these terms, please, pass your way ! Comme toujours, du beau et bon travail. Au plaisir. Good evening, I received your shipment, and I thank you for your seriousness and professionalism, the shipment as the packaging is perfect, the object is splendid. Thanks again. Medaglia arrivata ben confezionata e molto bella grazie ! Snelle levering en de items in uitstekende staat. Zeer goed. Medaglia molto bella come dalla foto grazie ! 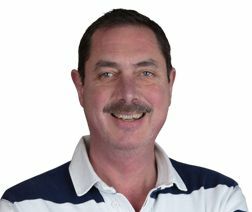 Vlugge en correcte afhandeling! Hartelijk dank. Perfect verlopen transactie. Meedenkende verkoper. Perfect verlopen transactie. Meedenkende verkoper! Snelle levering, goed verpakt, mooi. Kan niet beter. U kunt dit kavel ook ophalen bij de verkoper: Peutie (), België.